Couch grass or twitch grass (Elymus repens) is an old enemy for many gardeners. Its wiry, underground stems and creeping shoots pop up around garden plants and before long can take over a bed. As a perennial weed thorough killing or eradication of the roots is necessary. Couch grass is a common and invasive garden weed. It is a perennial grass which rapidly spreads by rhizomes (underground stems). Couch grass looks like just a tuft of any grass, but underneath the ground the roots form a dense network. It spreads rapidly by means of thin, wiry and sharp-ended rhizomes. From its tips, new shoots are produced in spring and autumn that quickly produce tufts of leaves and more rhizomes. 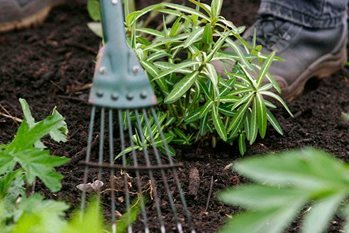 The network of rhizomes become entangled in clumps of herbaceous perennials and among shrubs and fruit bushes causing great problems, as they are difficult to remove. Couch can easily spread from infested lawns into adjacent borders. Couch is usually spread from garden to garden unwittingly when small sections of rhizomes become hidden among the roots of plants or in manures or soil. Couch is self-sterile and, as each spreading colony is usually a single clone, seeds are not often produced. In uncultivated areas, forking out is possible in lighter soils, as much of the underground stem system is fairly shallow, but it is easy to leave behind small sections of rhizome in the ground. These quickly regrow and need to be removed before they form a new network of rhizomes. In cultivated areas, hand weeding can be done where there are small isolated infestations among herbaceous perennials. This is best done in early spring when the plants will soon re-establish and around bulbs as the bulb foliage is dying, but is not practical around trees, shrubs and roses where roots may be considerably damaged. Strip off infested lawns and dig out any remaining couch grass roots before re-turfing. Glyphosate-based weedkillers (e.g. Roundup Ultra, SBM Job Done Tough Weedkiller (soluble sachets), Doff Maxi Strength Glyphosate Weedkiller or Westland Resolva Xtra Tough Weedkiller; or for spot treatment use Roundup Gel) are very effective and, if correctly applied, should kill even heavy infestations of couch. There are no selective lawn weedkillers that will kill couch grass while leaving the rest of the grass unharmed. Infested lawns should therefore be sprayed off with glyphosate until the grasses are fully killed. Only then can the area be dug over and prepared for re-sowing or re-turfing.